Finished my US taxes using Turbotax, just as difficult as ever, maybe more so with all the foreign account reporting. Deducting clothing and other stuff donated to Charity. This used to drive my wife's Canadian Uncle Art nuts whenever I mentioned it - "..you get to deduct the cost of old stuff you don't want from your taxes, that is crazy!..up here, nothing is deductible!.." Deducting mileage you logged for charity work, another Uncle Art peeve. Deducting insulation and weatherstripping for the house. The US forms only allow you to enter foreign addresses in the 1116 form to get a deduction for foreign taxes paid. If you try to report the foreign income that generated those taxes, there is no capability in the forms. You fill it in manually with workarounds such as listing Quebec as a state on form 4852. And they wonder why people don't always report their foreign income from pensions etc?? Virginia uses a different mileage rate for charity, so the Turbotax program has to account for this. The Virginia form looks like a misprint since it is set up to be machine-readable but not human readable. It looks like all the headings and boxes did not print out, but it is fine, it looks like this every year. 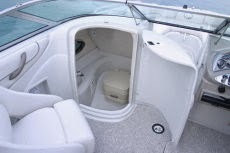 If we had a pontoon boat with a miniature chemical toilet under the console and a tiny stove (very popular here), I could deduct the interest on the loan to buy it since it is technically my second house. We don't have a party boat like this, but if we did, I would probably throw my back out getting into the toilet but the interest is deductible. There would also be no beans served at any meal.